You’ve probably heard of the concept of paying yourself first at some point, but never looked into what it meant. Don’t worry, you’re not alone. Most people don’t pay themselves first. Instead, they usually do the following. A person gets a paycheck, pays their bills and makes their usual purchases around town like groceries and gas. Then, at the end of the month, they look and see how much money is left in their checking account. If anything’s left, only then do they decide how much you want to move to savings. If this sounds like how you manage your money, I have a better way that can help you save more money starting today. It could easily change your life forever. What Does It Actually Mean To Pay Yourself First? In the above example, you paid yourself last. Instead of paying yourself first, you paid your monthly bills first. Then you paid vendors around town. At the end of the month, you finally paid yourself last. Paying yourself first is a simple concept. As soon as you get paid, you set money aside and move it to your savings account or investment accounts before you do anything else. Only after you pay yourself first do you pay your mortgage, car payment and other bills. Then, any money left over can be used to buy groceries and other things around town until you get your next paycheck. One of the most common ways people actually pay themselves first is through their retirement plans at work. The money you contribute to your 401(k), 457, 403(b) or other workplace retirement account comes out of your income before it even hits your bank account. So why does paying yourself first, rather than last, allow you to save more money? If we were all robots, it wouldn’t matter. Both methods would result in the same amount of savings. But we’re not. Instead, we have emotions, which are amazing, and financial weaknesses, which aren’t as fun. While a robot would be able to stick strictly to a budget without fail, we aren’t so lucky. Paying yourself first makes savings your top priority. When you transfer money to your savings account, you don’t want to admit failure and transfer that money back to your checking account. Instead, chances are you’ll try to come up with ways to make the money left in your checking account stretch until your next paycheck. Rather than going out to eat, you could opt to buy groceries to cook a home-cooked meal. You might have to turn down an invitation for a night out with friends or suggest everyone hang out at your house instead. While these options are a little less convenient or exciting, they provide the same opportunities to eat and socialize with a smaller impact on your bank account. These decisions won’t likely reduce your enjoyment of life and in some cases may actually increase your enjoyment. It also helps to remind you to put high priority savings goals ahead of frivolous spending. By making savings the priority, rather than everything else, you set yourself up for success to reach your financial goals. Paying yourself first may not seem like a big deal, but it unlocks the ability to change your financial life forever. At first, you’ll likely just start putting money in a savings account, which is great. You’ll be able to build an emergency fund, which can literally save your life in some situations. In addition to putting money into a savings account after it hits your checking account, there are other ways you can pay yourself first, too. If you have high interest rate debt, you can also pay yourself first by making extra principal payments on the debt. While this isn’t saving, it does improve your net worth and puts you in a better financial position overall. After you have your debt and emergency fund taken care of, you can continue to pay yourself first by increasing your contributions to your retirement account at work. But, workplace retirement accounts aren’t your only option to invest. You can make automatic investments with taxable brokerage accounts, IRAs and Roth IRAs, too. These investments have huge potential, especially if you have decades until you need the money. 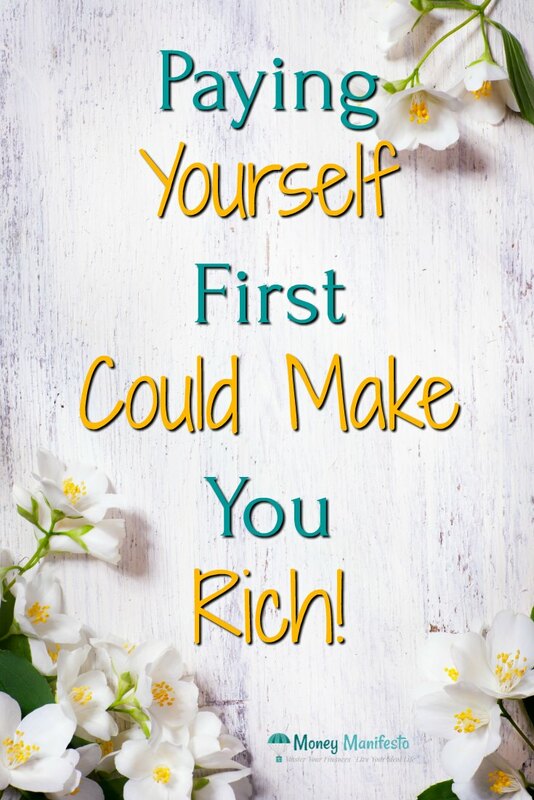 Consistently paying yourself first combined with compounding returns could easily make you a millionaire. Paying yourself first doesn’t have to be for emergency savings and investments. You can pay yourself first for fun goals, too. Other great ideas for things to pay yourself first for include a down payment for your next car, your first house or so you can take the trip to Europe you always dreamed of. Paying yourself first puts you in control of your money. It allows you to make the big financial goals in your life a priority and can make you wealthy in the process. You can even use the pay yourself first concept to save for smaller expenses you know will pop up. If you’re going to need new tires, a new water heater or any other big purchase, you can divide the total cost by the number of months until you’ll need to make the purchase. Then, pay yourself first that amount each month so you won’t have to put the purchase on a credit card. After you’ve worked out the kinks in the first few months of paying yourself first, it often makes sense to automate the process. Automating gives you the best chance at succeeding when it comes to paying yourself first. Automating the process can be done in a few ways. First, you can set up an automatic transfer from your checking account to your savings account with your online bank. Usually, you can set up recurring transfers using online banking. If you get paid on the same days every month, you can set up monthly recurring transfers for those days. If you get paid every two weeks, most banks have an option for that, too. Another way to automate the process is by asking your payroll or human resources department if you can split your direct deposit into multiple accounts. If they allow this, you can directly deposit part of your paycheck into your savings account automatically. Changing a direct deposit takes more effort than changing an automatic transfer at your bank, so it gives you even more incentive to keep saving. If you want to invest with your pay yourself first money, many brokerage firms allow you to set up automatic investments, as well. If you’re going to be paying yourself first, you’re probably going to build up a decent balance in your savings account. When you do this, it’s important you pay attention to the interest rate your savings account pays. Most major banks have savings accounts that pay very little interest, but there are plenty of online bank accounts that pay amazing interest. Personally, I’ve found that CIT Bank’s Savings Builder account encourages me to save every month and pays an amazing interest rate at the same time. You can qualify for an amazing interest rate by depositing $100 each month or having $25,000 or more in your savings account. You can learn more about this awesome account and the way it incentivizes to save in our CIT Bank Savings Builder review. Open a Savings Builder High Yield Savings account and get a 2.45% APY. See site for full terms and conditions on this offer. What Happens If I Run Out Of Money Before I Get Paid? Paying yourself first can sound super scary, especially if you’ve never attempted this method before. Thankfully, there is nothing to be scared about. When you’re first getting started, you’ll likely pay yourself first into a savings account rather than an investment account. This allows you to have a fall back plan in case things don’t go as planned. If you find yourself running out of money before you get your next paycheck, you could in theory always transfer the money back to your checking account from your savings account. Obviously, you’ll want to avoid this if at all possible because you won’t save money very fast. However, the option is there until you get comfortable and figure out how much you can pay yourself first each paycheck. Paying yourself first sounds awesome, but it only works if you take action. Set a reminder in your phone or on your favorite calendar app for your next payday. When the reminder goes off, go transfer money from your checking account to your savings account. If you want to have an even larger chance at success, set up a new savings account for your pay yourself first money. Then, set up an automatic transfer so you can’t forget to save. To prevent yourself from transferring money back into checking, open the savings account at a different bank to make the process just a little more difficult to access your money. You can still get to the money you need in a day or two, but it will make you think twice before clicking transfer. What questions do you have about the pay yourself first methodology? Does this sound like something that will work for you? Let us know your thoughts in the comments below. This seems to be a easy idea to grasp, but much more difficult to apply. When you have bad habits your whole life, changing the proves to be a challenge. I would like to see more of this financial education included in school at the high scholl level at a minimum. Thank you for your post, Lance. Automatic deductions via my 401k is my current method. I still have some savings and need to implement another automatic plan to pay myself even more. Thanks for the reminder! Glad I could help. Are you saving for something fun? I use automatic deposits to ING direct savings, and an IRA. I’m a big believer in automation, so I like to set everything up for automatic routing from my checking to savings,IRA, mortgage, car payment, etc… then I tweak when my income changes. The best thing is not even noticing the money leaving my checking account. My net worth builds every month without my involvement!. How cool is that? I have to admit we have not been doing this as much as we should but that is changing. We are going to sit down this week and have a money talk and set up those automatic transfers. Thanks for the reminder about how important this is. Glad I could help! Best of luck at the money talk! This is so true, many people should make this a ritual with any income they receive. I like having barriers to money because then it grows and I forget about it. 20% should be the standard pay yourself amount on any income you get, beginning with your first job. Most kids who finally get that first job, still live at home with mom and dad, so 20% should be a breeze. 20% is a good starting point but you can save even more if you really try. Retirement and multiple other goals can make that 20% seem awful small sometimes. I always pay myself first. This is how I budget. Like you said automatic deductions are great. I get my 401k contributions, employee stock contributions, and roth IRA contributions automatically taken out of my paycheck/account. Then I pay myself (my savings accts) with a huge chunk of my pay and then leave the rest for budgeting and living expenses. What are you saving for in your savings accounts? I have been paying myself first for some time now. I automatically have money to into my IRA and into a few different mutual funds. IRAs are a great way to pay yourself first. I contribute to the 401k and it works very well. I don’t miss the money at all and my retirement fund is growing. Definitely a great strategy! You can even save for your early retirement in non retirement accounts this way too. This is difficult, especially for those on variable income. I like the concept, but I can’t have automatic payments coming out since the money often times isn’t there some months. Like Joe said you can still do it even if it isn’t automatic. Just set aside some money whenever you can when you get paid. Yes! I set up a payroll deduction for savings (403B, IRA, Roth IRA). Savings is my number one financial priority. When I bought my first house in 1973, I set up a payroll deduction to accumulate my real estate taxes and annual insurance). I have had the savings habit ever since. I FULLY agree with this! I’ve been paying myself for years and have built it up to the max IRA contribution! Do I miss buying a lot of unnecessary stuff – nope! The trick is to do it little by little and to never stop. Treat it like a bill!! I started out with an amount I pay myself first and try to increase it all of the time. While I know I should be paying myself first, unfortunately I never really have. I am so focused on paying off debt first, which may or may not be the right way to approach it. Paying debt down is a good option too. If you don’t have any debt that paying yourself should be goal number 1. This is my next big goal after I’m debt free in a month. Specifically I want to save for a replacement vehicle so I don’t have to end up paying others’ interest on a loan. This is powerful if taught to young people. Definitely a great goal. Congrats on the debt payoff being so close! Sigh…I have sort of been doing this, but because my income is all over the place I haven’t quite organized it in some sort of regular system yet. I just keep moving money around. I need to get a grip on that because I totally agree with you on this concept! You don’t have to have an automatic system. You can still pay yourself first whenever money comes in. It just takes more willpower and effort. I have forced savings through work (my pension contributions are required, they come off before I get any $$, and I can’t touch them no matter what). Plus I also have automatic transfers to savings accounts, other retirement accounts, and education accounts for my kids. Our emergency cushion needs work, but retirement is looking OK for now. You are doing a great job saving for so many different things. I’ve been sort of paying myself first. I put it into my various funds (wedding, car, medical, so on)and really try to keep the money the same. It does help that we’re paying for the wedding so I can’t change that amount (unless it is to increase it) without hitting the amount we want saved for it. After all that and bills and other necessities are paid, we also try to save even more money with whatever is left over. Doesn’t always mean we’ll get extra money or a lot of extra money but I feel that even $5 saved or put toward debt is worth it. I agree! Every little bit helps and gets you in the habit of it.